So quoth the Raven, “Nevermore.” Ever since reading Poe’s “The Raven,” I’ve wanted to own one of these magnificent birds! In horror movies ravens (as well as crows) are portrayed as the bringers or messengers of evil, darkness, and despair but when you look beyond the superstitions and Hollywood storytelling you’ll soon realize that these are extremely intelligent birds that are, in fact, on the same level as chimps and dolphins! But I wonder…would a Raven (or a crow) make a good pet? The raven and the crow are similar in behavior but their physical differences are many. Ravens are much larger than a crow with a four foot wingspan and a height of 25″ as compared to the crows 18″. The feather and tail shape of a raven also differ and the raven’s bill is a bit heavier than the sleek crow’s bill but the most notable difference is when they take flight. The raven is a soaring bird that loves to glide and show off while crows will never be seen performing such daring maneuvers! Implemented in 1916, The Migratory Bird Act prohibits anyone in the United States from owning any migratory raven or crow in the U.S. unless you are a licensed wildlife rehab facilitator. There is a way around the act, however, if you purchase a raven or crow not native to the U.S. The white necked raven and the pied crow originate from Africa and they’re a very common species. They would be legal birds to own but alas, another roadblock! Due to regulations regarding the transportation of wild birds across oceans, neither corvid can be shipped to the U.S.! Give Me The Bird…The Bird! Still want a pet crow or raven? You’ll need to find a reputable breeder. But when you do locate a breeder, expect to pay a pretty penny for these birds. Some cost around $2,000 but the price could skyrocket to around $6,000! Acquiring a new pet is a decision that shouldn’t be taken lightly. 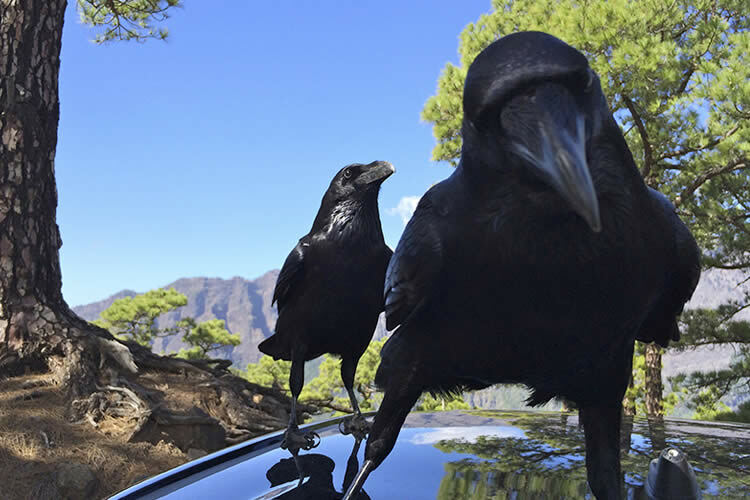 When it comes to ravens and crows you should know they require specialized attention and care. These birds cannot and should not be caged. They require a lot of space like a large, outside aviary. These birds need some freedom and caring for them will consume a lot of your time. And I mean a lot of your time. Corvids can live up to fifteen years but their lifespans have been known to double in captivity! Shelters, sanctuaries, and aviaries are great places to volunteer if you’d like to learn more about taking care of birds. Many times injured or orphaned birds are taken to these places who often accept volunteer help. You could learn from experts how to take proper care of birds. Being exposed to various types of our winged friends may aid you in understanding and addressing the problems you could encounter by owning a raven or crow. Ravens and crows could be intriguing companions as they tend to bond closely with their owners. Conversation wise they may give you a run for your money because they tend to imitate human speech much better than a parrot. They can also imitate sounds like cars and whistles. They may even attempt to hold a conversation with you. So (on the wing) you should, over the years, get your money’s worth, word per word, for the price you’ve paid for one of these amazing birds!